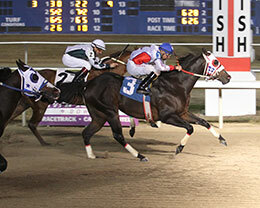 Ivan James, under jockey Raul Ramirez Jr., defeated Octonaut (#2) to set the fastest qualifying time for the $162,600 Evangeline Downs Derby Saturday evening at Evangeline Downs. OPELOUSAS, LA�NOVEMBER 26, 2016� Ivan James, who earlier in 2016 was the winner of the Grade 2 Firecracker Derby at Delta Downs, was the fastest qualifier for the $162,600 Evangeline Downs Derby from the eight trials run on Saturday night. He covered the 400-yard distance in a final time of :19.553 seconds over the fast track, which translates into a speed index of 101 with a 4-mph tailwind. Ivan James won the second trial of the evening, which proved to be the most competitive of all of trials on Saturday. In fact, three of the four fastest qualifiers for the final all came from this trial. Octonaut qualified with a time of :19.621 seconds and Bloomer Ride qualified with a time of :19.653 seconds. Ivan James is a 3-year-old colt by IVORY JAMES and is out of the Dashin Bye mare, First Dashin Bye. He was bred in Texas by his owner, Jorge Meraz and trained by Jose Sanchez. Raul Ramirez, Jr. was aboard for the victory on Saturday night and also rode the colt to the victory in Firecracker Derby back in July. The victory in the trial on Saturday night was the fifth win in nine lifetime starts for Ivan James. The $3,000 first-place purse increased his career earnings to $398,817. Each of the eight Evangeline Downs Derby trials offered a purse of $5,000 and the Evangeline Downs Derby final will offer a purse of $162,600. The Evangeline Downs Derby will be run as part of the closing night program on Saturday, December 17, along with the $317,500 Evangeline Downs Futurity. For a complete list of finalists, times, sires, dams, owners, breeders, trainers and jockeys for the 2016 Evangeline Downs Derby CLICK HERE.